Whether you want to borrow for a home, a car, or a credit card, getting preapproved for your loan makes life easier. You know exactly how much you can spend, you’re in a better position to negotiate, and you understand the costs of your loan before you end up in something that you can’t afford. How do you get preapproved for a loan? Gather information about your finances and the loan you need, and then apply. Follow the steps below to make the process easy. Especially when getting a mortgage and buying a home, it’s tempting to dive into more interesting tasks, but you’ll thank yourself for getting prepared ahead of time. Your credit is crucial for almost every loan. 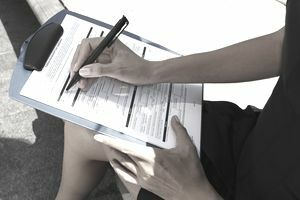 Unless you’re getting a payday loan (which is generally not a good idea) lenders need to review your borrowing history. Make sure they—and you—don’t get any nasty surprises when that happens. Learn about credit: Your credit is one of the most important factors for getting preapproved. Understand how it works, what lenders are looking for, and how credit scores work. Check your reports: Order your credit reports to see what they contain. All U.S. consumers are entitled to one free credit report per year under federal law. View your credit reports from each credit bureau. Read through the report and see if any late payments or errors appear in your reports. Fix errors: If there are errors in your credit reports, fix them. The Federal Trade Commission (FTC) reports that 5 percent of consumers have errors in their reports. While that number isn’t outrageous, the consequences of a mistake are severe, resulting in denial or significantly higher mortgage payments every month for years to come. Report any errors to the credit bureau and to any lender that’s reporting the error. Learn more about fixing errors. Lenders ask for information about your finances to evaluate your loan application. Gather the information ahead of time so that it’s easy to apply—and to give yourself a refresher on your finances. It’s helpful to see up-to-date information about your income and assets before you take on additional debt. Ability to repay: You’ll need to prove that you have sufficient income to take on any new loans. Lenders typically calculate a debt to income ratio, which looks at how much you earn compared to your monthly loan payments. With some lenders, you need a debt to income ratio below 36 percent to get approved, although others allow you to go higher. You might not need to submit copies of all of those documents get preapproved, but at least figure out where they are and get familiar with them. Any information you provide on a loan application needs to be accurate, so you need the information anyway. Lenders may request additional documents, so be prepared to respond. Especially if you’re self-employed, you may need to explain how your business works and where profits come from. Details about your purchase: You might also have to provide information about the property you’re buying. The more detail you have, the better—your lender’s offerings may change, depending on how you intend to use the money. For example, when getting a mortgage, are you buying a single-family residence, or is it a condo unit in a building with 50 units? For auto loans, what is the make, model, and year? Used car loans are different from new car loans. At this point, you’re ready to shop around for lenders. You probably only need to get preapproved with one lender to start shopping and using your preapproval letter as leverage. Still, it’s worth comparing loan costs among several lenders before you commit to anything. You’re not obligated to use a lender that preapproves you, but it makes sense to go through the preapproval process with lenders offering the best terms—otherwise, you have to do everything multiple times (and share your personal information with numerous lenders). Get quotes from different types of lenders: Include several lenders—and several different types of lenders—in your search. Ask banks and local credit unions for home, auto, and credit card loans, and try an online lender or local loan originator as well. For personal loans, consider online lenders and P2P lenders. They often have competitive rates, and they may be willing to work with borrowers who have less-than-perfect credit. Pre-qualified or preapproved? For credit card loans, some lenders build a list of potential customers who are “pre-qualified.” If you’re on that list, there’s a decent chance that the lender wants to work with you. However, there’s no guarantee that you’ll be approved—you still need to submit an application, and lenders might find something they don’t like. After you choose lenders and prepare yourself, it’s time to apply. There’s only one way to find out how much you can get: Complete an application and wait for an answer. Responses may come quickly, or you may have to wait. Answers for auto loans and online personal loans typically come more or less instantly. Mortgages can take notoriously long, with lenders asking for a seemingly endless list of documents—right up until closing. That said, some lenders do a more abbreviated once-over when you get preapproved, so the process is typically faster than a complete underwriting. False hopes? Some lenders claim to preapprove you without really looking at your finances. If they don’t run your credit or ask about your income, it’s a bad sign. For preapproval to mean anything, lenders need to actually evaluate your creditworthiness. It doesn’t do you any good to get a flimsy “preapproval” and later find out that you can’t borrow as much as promised. To avoid problems, work only with reputable lenders. Start with banks and credit unions in your community, as well as legitimate online lenders. Avoid fly-by-night outfits and anybody who claims to approve everybody.